M&A insight within the food & beverage industry sheds light for executives in other manufacturing categories. As food and beverage companies continue to face disruptive pressures – in large part spurred by changing consumer preferences, with an increased demand for organic and natural products – the industry is being forced to adapt. Acquisitions are increasingly helping food companies expand their product lines, increase efficiencies, meet consumer demand and maintain market share. According to Mergers & Acquisitions, the U.S. food industry saw $42 billion in deals in 2017, and deal activity within the food and beverage industry has remained active in 2018. This sentiment aligns with data from a recent survey conducted by Mortenson, in which 67 percent of CFOs surveyed say that mergers and acquisitions (M&A) was likely for their company in the next three years. When food and beverage companies turn to acquisitions, there is one area that is often underemphasized. 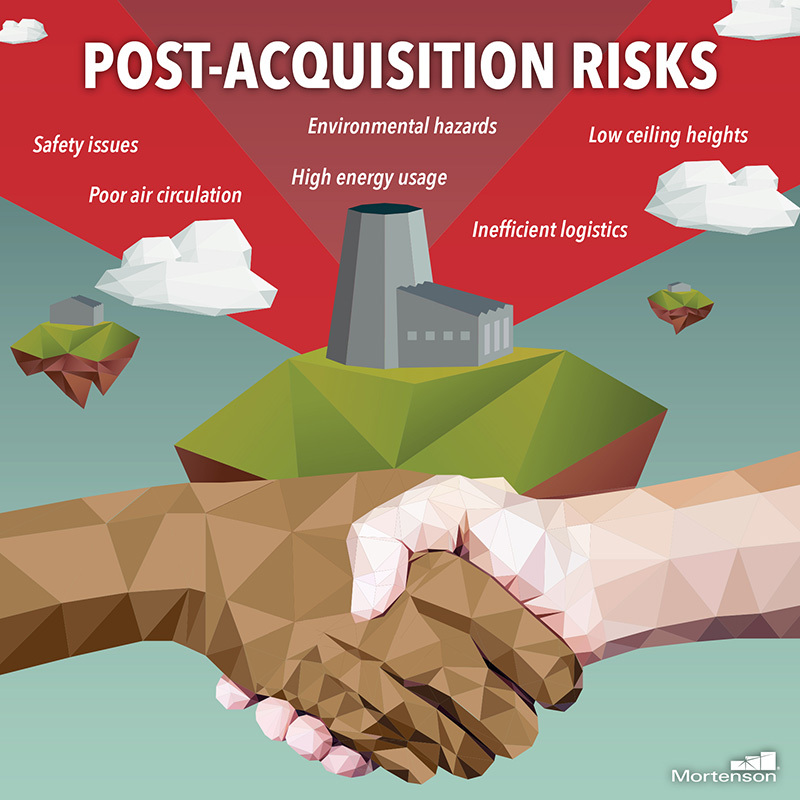 According to the Mortenson survey data, 78 percent of executives say that facilities carry a risk during M&A, and 38 percent say that in their experience they uncovered a risk within the real estate and facility portfolio after a deal transaction closed. 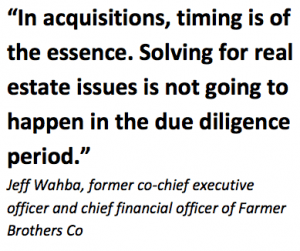 While at Farmer Brothers, Wahba led the integration of a $30 million Coffee Bean International business and an over $200 million Sara Lee coffee business, after both were acquired within a short amount of time. What they did not anticipate was the magnitude of issues that would come with one of their acquired manufacturing facilities. Whether conducting environmental audits during due diligence, or simply acknowledging that there may be issues that they will need to address later, CFOs across all manufacturing categories often think they have their real estate covered prior to the acquisition. For a $4 billion food processing company, the expensive surprise came in the form of unplanned plant shutdowns leading to loss of production and high energy costs. 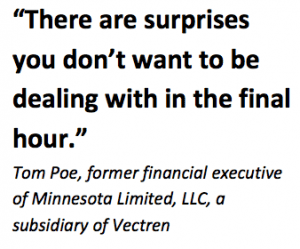 In analyzing these facilities, Mortenson found the company could implement a renewable energy solution that proved 189 percent return on investment and a five-year payback period. “What a CFO should do as part of their 90-day plan is a full facilities audit up front – ideally with a third party firm. We didn’t do that – and I think we definitely paid for it,” says Wahba. By way of a real estate portfolio assessment, executives can ascertain the true conditions, costs and opportunities for existing assets across their combined ecosystems. “Increasingly, executives are relying on outside consultants to uncover not only hidden issues, but also hidden value,” says David Wood, project manager at Mortenson. Untapped opportunities often exist that executives can turn into significant ROI wins for the combined company. For a large utility, Mortenson discovered a $129 million property valuation for a severely underutilized site and subsequently devised a capital expenditure plan, a capital improvement plan and a new facility growth plan that allowed the company to capture real value that otherwise would have been missed. “Across multiple industries, executives are increasingly seeing a need for this type of visibility and certainty in order to make crucial strategic decisions,” says Wood. According to Mortenson survey data, over two-thirds of CFOs said that M&A conditions would increase the strategic importance of their facilities. With M&A activity remaining strong for all types of manufacturing in 2018, executives analyzing their newly acquired businesses and expected synergies should take a second look at their real estate portfolio.